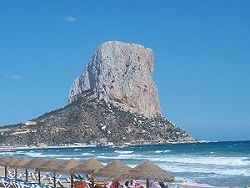 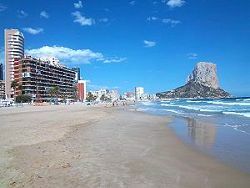 Calpe, known, amongst other things for it's very obvious rock, the Penon de Ifach (now a nature reserve), which rises 332m out of the sea, is a town on the Costa Blanca coast of Alicante province. 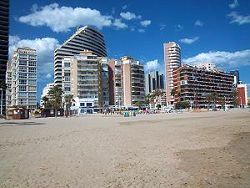 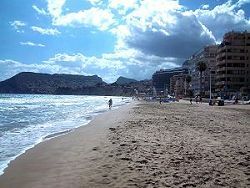 Here you will find that almost ideal combination of beautiful sandy beaches, old Spanish charm, and modern conveniences. 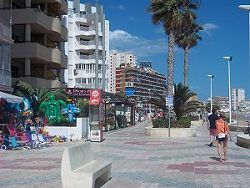 There is an old walled town centre, well worth a visit, an old fishing port where you can see fresh fish being landed and auctioned, and a modern marina. 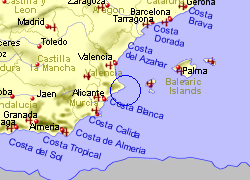 You will find plenty of bars and restaurants that serve locally caught fish. 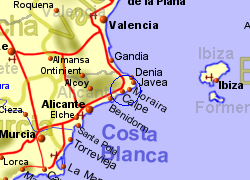 The narrow guage railway, running from Alicante to Denia, passes through Calpe. 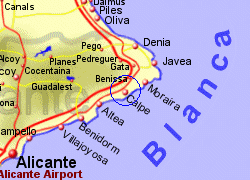 Map of the Calpe area.